Integrated Concepts was founded in the mid-1990s, serving the audio/ video, security and connected home needs of discerning clients throughout Fairfield County, Connecticut. Owner Rich Babcock offers precisely tailored solutions that address the unique needs of each customer. By creating a demonstration environment within a local home, Babcock is able to expose prospective clients to the newest technologies in an environment that is not at all intimidating. From a video projector-based home theater to window treatments, advanced use of security cameras, home automation and whole-house entertainment, the Integrated Concepts show home is an ideal environment to highlight the ever evolving world of the connected home. Having an appointment-only environment like a show home is very different from walking a customer through a retail store. Babcock first endeavors to understand some of the client’s specific needs so that when he arrives for their appointment, he is prepared to demo the proper technologies. 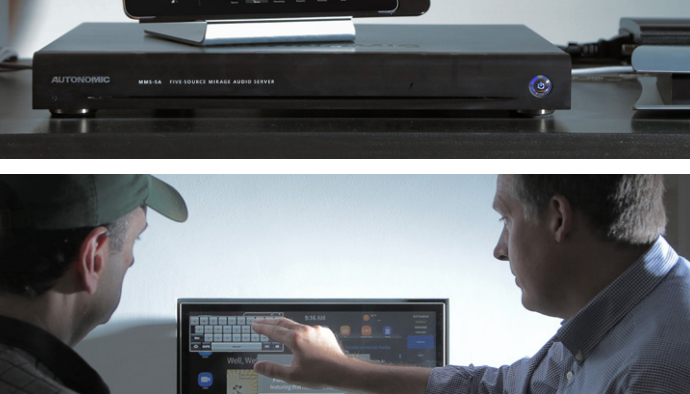 The wholehouse entertainment platform in the home is based upon an Autonomic MMS-5A controlled within the Crestron environment. Babcock can demonstrate everything from a 20-inch, in-wall touchpanel, a 15-inch tabletop touchpanel as well as both iOS and Android portable devices using the Crestron Smart Graphics™ interface. Functionality is the same across all platforms, which Babcock indicated is important to his customers. There are architectural speakers throughout the home and an audiophile listening area adjacent to the upstairs master bedroom. Streaming services offered are Pandora, Spotify, TIDAL (premium versions) and TuneIn. 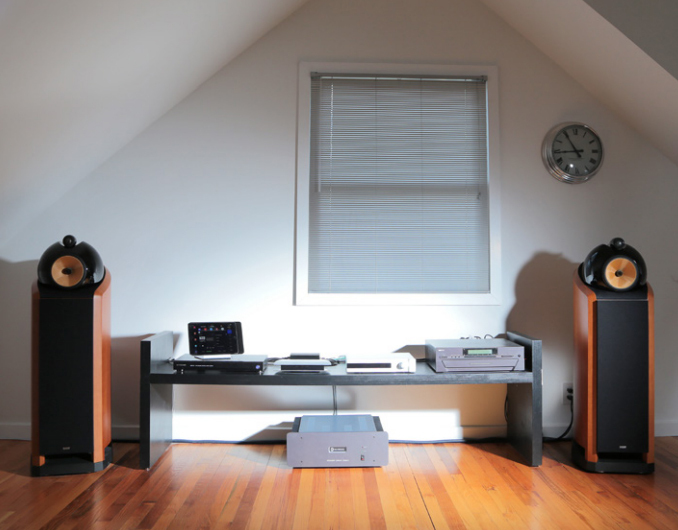 The upstairs listening space at the Integrated Concepts Show Home featuring an Autonomic MMS-5A and high-performance entertainment system. This gives the customer an opportunity to explore the functionality of each service and the superb sound quality of TIDAL, especially in the upstairs listening system. Babcock feels strongly that demonstrating all of the services through a single intuitive interface helps entice his clients. “In order to deliver the desired streaming services, we used to employ multiple devices such as Apple TV and others. 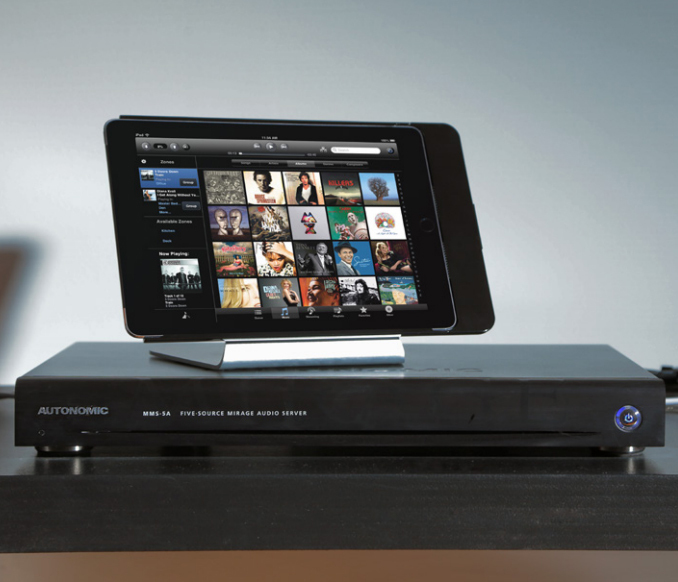 Now with Autonomic and their exceptional native integration with Crestron, everything has been aggregated into a single experience, including local content such as iTunes and/or large collections stored on external drives,” said Babcock. The Autonomic MMS-5A with iPad interface at Integrated Concepts. The interface is great, the firmware updates keep things operating smoothly—this is the solution that works no matter what size the system and regardless of which streaming services you choose. The Integrated Concepts show home offers a basement theater experience featuring 4K video and 4K video switching along with the latest HDCP 2.2 support. Autonomic streaming content is also available to be enjoyed in the theater.